To me this native herb is full of surprises. I love opening the bag when I need to pack it for an order and that wonderful licorice smell fills the room. It brings back so many childhood memories of eating licorice and those yummy Choo Choo bars that lasted for ever. 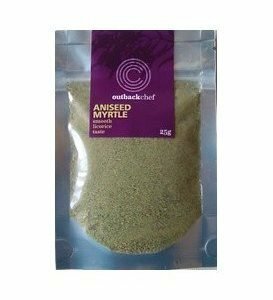 Aniseed myrtle always adds a special and unique flavour to any dish. Try it with prawns instead of the traditional pernod, it doesn’t have to overwhelm, the flavour of this herb, strong though it is, can be added “gently” , be subtle with it’s use, it won’t disappoint. Aromatic, & spicy... Wattleseed from S.A., Mountain Pepperleaf, TAS. 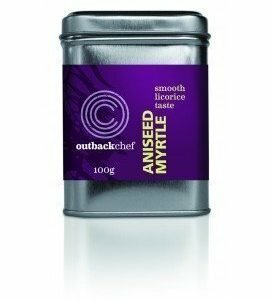 and Aniseed Myrtle, NSW plus a blend of exotic Eastern spices. Gluten Free, no nasties, the perfect curry to have on hand.